Yesterday was a big day for Google. The tech giant unveiled Google Stadia at GDC 2019, a video game streaming platform that promises 4K 60fps streaming on practically any device including phones, tablets, laptops and TVs. While many details are still to come, such as price, Google is allowing the service to work with wireless controllers you already own including the Xbox Adaptive Controller (thanks Windows Central). 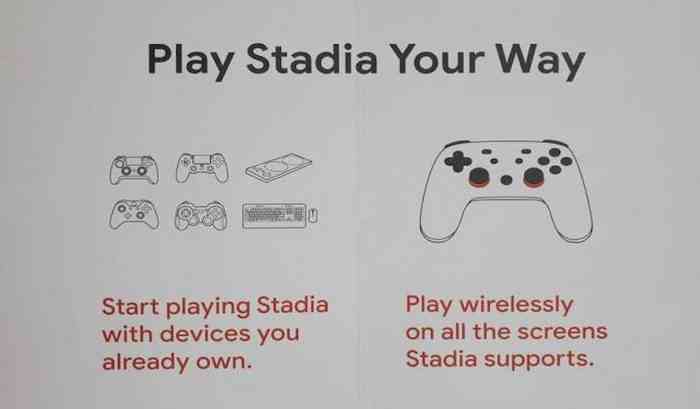 On stage, Google showed the above image which shows the type of controllers users can use to play their Stadia games. The Xbox Adaptive Controller can be seen on the left alongside a keyboard and mouse, a DualShock 4, an Xbox One controller, and even third-party variants. This is already a huge get for Google and it shows that the Android company is playing nice to get Stada out to everyone. There is always going to be uncertainty around latency and delayed input when it comes to game streaming but if Google can live up to its promises, this just might be the industry’s leading example of how to do it right. The Xbox Adaptive Controller — a rig that makes playing games possible for people with limited hand and arm mobility — was released by Microsoft last year. Priced at only $99.99 USD, the Xbox Adaptive Controller has earned lots of praise inside and outside of the gaming industry. It was built from the ground up with input from many different communities including The AbleGamer Charity, The Cerebral Palsy Foundation, SpecialEffect, Warfighter Engaged, and more. Late last year, the controller made TIME’s 50 Best Inventions of 2018. Now that the news has sunk in, what are your thoughts on Google Stadia? Share them with everyone in the comments section down below.